Congestion is the bane of urban life in Canada, as it is elsewhere in the world. Too many people driving too many cars at the same place at the same time—that’s congestion. Growing urban populations, lack of accessible and reliable public transit, outdated infrastructure—all of these contribute to the growing trend of road congestion in our cities. While road-use is free, congestion is extremely costly—both to our economies and our quality of life. On November 2nd, Canada’s Ecofiscal Commission will launch a major report on the critical missing piece of our urban mobility agenda: congestion pricing. We Can’t Get There From Here: How Pricing Congestion is Critical to Beating It sheds light on the costs of congestion that we cannot solve with more road and transit capacity alone. It highlights the various and diverse pricing policy approaches that have been used successfully to reduce gridlock in cities across the world. And it considers how these lessons could apply to four of Canada’s biggest cities. Video about the Canada Ecofiscal Commission. Peter Callaghan writes an excellent piece for MinnPost “So how, exactly, do officials figure out how many people will use mass transit projects?” I was interviewed, as was Marty Wachs of UCLA and local planning officials and planners. In a seminal 1992 study of the effects of the federal funding system, however, transportation economist Don H. Pickrell found that cities favored expensive capital projects over improved bus systems, largely because that was where the money was. The funding system had produced an incentive to overestimate ridership and underestimate costs. And why not: local agencies weren’t held accountable for the accuracy of their forecasts. Levinson agrees that ridership forecasting is better today than it was. “There are probably still a few places you could stick your thumb on the scale, but not as many,” he said. The FTA rules and guidelines also have the ability to produce underestimates of ridership, something that isn’t exactly unwelcome for transit agencies. “Agencies will use high forecasts to sell the project, then lower the forecasts so they can exceed that forecast when it opens,” Levi[n]son said. … forecasters look at how people actually live and travel. Rather than count a trip from home to work as one trip and a trip from home to school as another, for example, the new method recognizes that people might go from home to work to lunch to the dentist and then to home. “We’re modeling what people actually do,” Filipi said. Levinson, who is one of the experts conducting a peer review of the new models (which won’t be in place until after SWLRT is funded), agrees, saying the activity-based method more accurately capture how people actually use transit. “You can’t choose a car for going from work to lunch if you didn’t take a car to work,” he said. For all the sophisticated modeling, though, both Wachs and Levinson concede that it’s impossible to separate the technical aspects of forecasting from the politics. Levinson, for example, said forecasts of costs and ridership are not used to determine which localities win federal money but to justify those decisions. “If [Rep. Martin] Sabo and [Rep. James] Oberstar are well placed, their projects will get funded because it’s not just on cost effectiveness or ridership,” Levinson said of former congressmen who backed the region’s first light rail line. Local agencies should have an interest in not overbuilding or not building at all if the ridership isn’t there. And general managers who have to operate those systems do worry about unsustainable projects, Wachs said. But the elected officials are more interested in “ribbon-cutting” and figure that by the time the operating shortfalls appear, they’ll be out of the picture. Pass Type: Conference Pass, Demo Hall Pass – Get your pass now! Auto industry analysts believe the arrival of autonomous cars is inevitable. The question is not if, but how soon. Signs of this trend include recent advancements in Advanced Drivers Assistance Systems (ADAS). But do we really understand what it means for driverless cars to share the roads with drivers and pedestrians? What technology is needed and what must we learn before machines and humans can happily co-exist on Route 66? *Moderated by Junko Yoshida, EE Times. The evidence now shows people visit friends less. While we don’t know for sure that the internet prompted this, time online continues to rise, especially mobile. Time spent socializing off-line has dropped about 8% in less than a decade, from over 40 minutes per day in 2003 to 37 minutes in 2011 according to the American Time Use Survey. 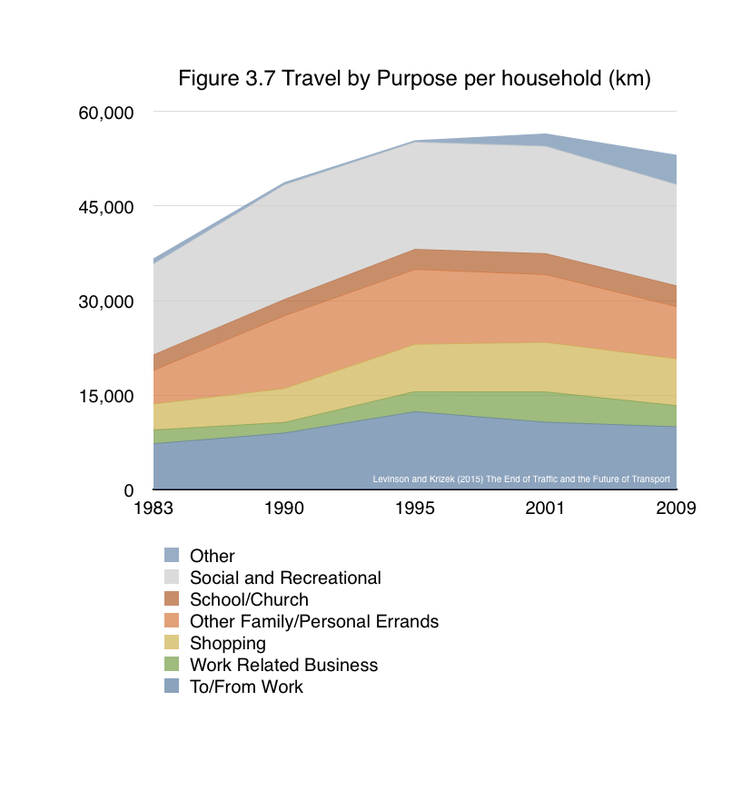 As shown in Figure 3.7, recession impacted or not, the National Household Travel Survey finds social and recreational travel has dropped markedly in absolute terms from 1990. While lack of work obviously crimps work travel, the lack of work in principle frees up time for non-work travel, particularly things like visiting friends. Figure 3.7 Source: Table 5: Summary of Travel Trends, 2009 National Household Travel Survey. Advances and changes in logistics distribution also are important. One can expect similar levels of murkiness from freight transport — a transition that will be influenced by enhanced graphical interfaces, 3-D printing, and changes in freight delivery. The less that is fetched, the more that is delivered. Stuff needs to get in the hands of consumers. While most people shun trucks and delivery vehicles, potato chips still need to get on the shelf of the food store or your home somehow, as the immaculate conception of deep fried crisps has yet to be discovered. 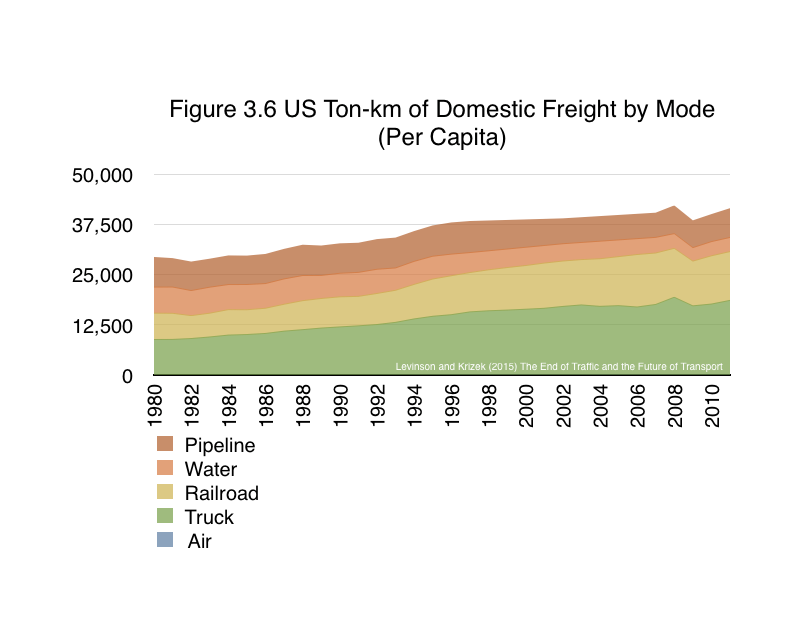 The amount of freight moved by various modes plummeted during the recent recession. Now truck travel appears to be generally slowly on the rise , even at the per capita level, in the US. The US currently has three national networks (USPS, UPS, FedEx) delivering stuff to consumers in ways that are cost effective for many goods. Specialty services are on top of this—local stores and restaurants that deliver their own products (furniture, appliances, grocers, newspapers, milk, pizza), and one can certainly imagine others emerging. neighborhood refrigerators for grocery dropoff. Table 1-50: U.S. Ton-Miles of Freight (BTS Special Tabulation) (Millions) . The rise of online retailing allows people to substitute delivery for fetching, and reduce the amount of shopping trips. Sears and Montgomery Wards were famous for their massive catalogs, particularly come Christmas time. Catalogs were replaced by the Internet, seemingly a case of the old being dismissed by the new: Sears by Amazon. Notably, Sears phased out its Big Book in 1993 and started shrinking its Wish Book that same year. Amazon was founded in 1994. Not only can shoppers do the same thing differently (and better), they can do many more things enabled by the technology of the web. Amazon, which now claims 1% of total retail sales in the United States, has become the single one-stop shop for everything. Given that Amazon is now over twenty years old, its hardly considered new anymore. However, its influence on how people “go” shopping is now unparalleled. 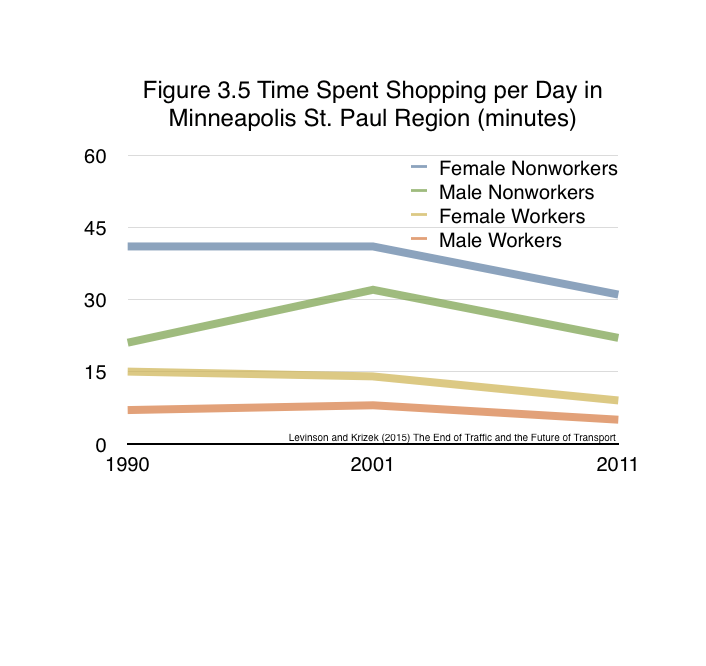 Figure 3.5 Source: Twin Cities Travel Behavior Inventory, Metropolitan Council. Analysis by authors. Figure 3.4 Source: Cao, Jason (2015) Telecommuting and its relationships with travel and residential choices: An exploration of the 2000 and 2010 regional travel surveys in the Twin Cities. (Working paper). Americans now work fewer hours over their career than their working grandparents, and probably their parents (for annual hours. There has been little change over the past 7 decades). They start their careers later, extending the pre-work period into their twenties, taking advantage of productivity gains of parents and ancestors, and borrowing against future productivity. They also retire earlier, post-work retirement starts into their fifties, reaping the rewards of our collective productivity. Vacation time has not changed much in recent decades. Figure 3.3 Source: Huberman & Minns (2007) – The times they are not changin’: Days and hours of work in Old and New Worlds, 1870–2000. Explorations in Economic History, 44(4):538–567. 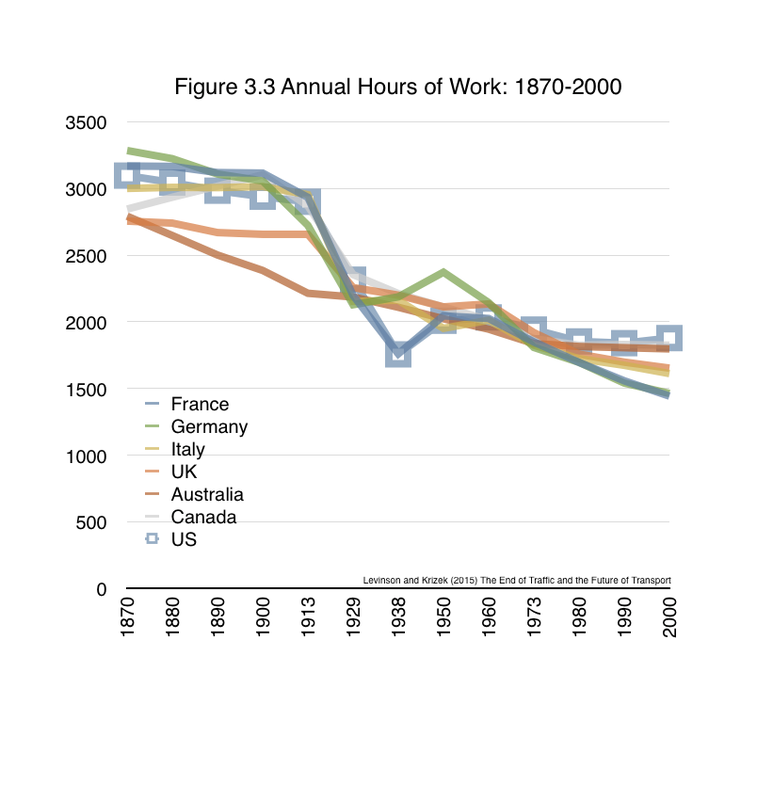 via Max Roser Our World in Data http://ourworldindata.org/data/economic-development-work-standard-of-living/working-hours/. 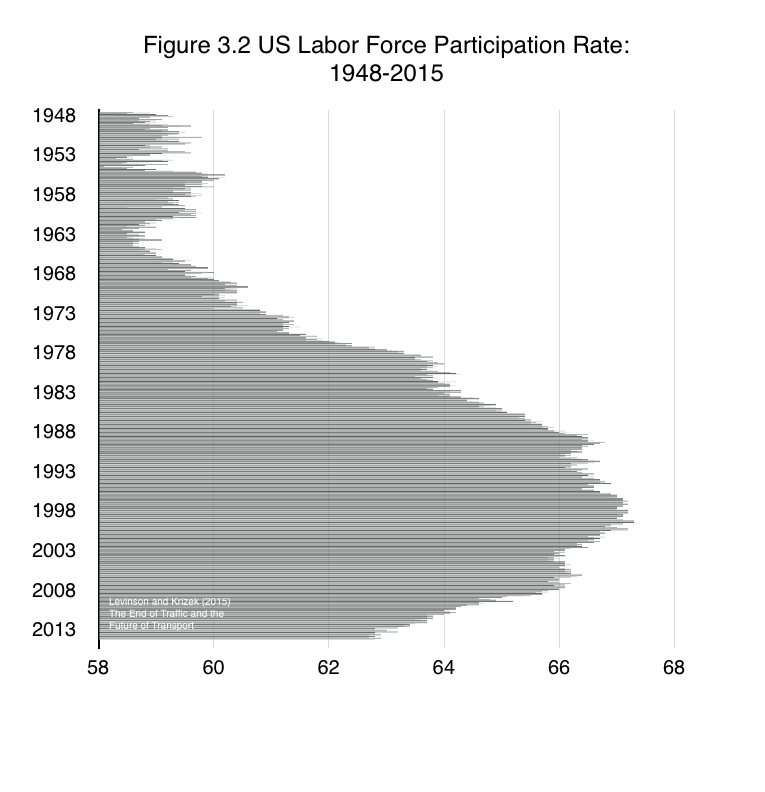 Figure 3.2 Source; US Department of Labor – Bureau of Labor Statistics (2015) Labor Force Statistics from the Current Population Survey http://data.bls.gov/timeseries/LNS11300000.